My favorite social media time management tool is the Hootsuite social media dashboard. Hootsuite enables me to manage multiple social media networks so it seems like I’m on social media all the time. Their free version lets you manage up to 5 social networks, so don’t do it all yourself! 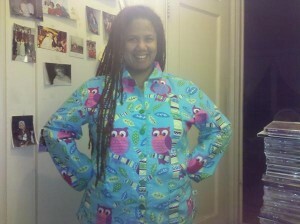 I recently picked up these flannel PJs from Target, which my roommate Tym Moss dubbed my “Hootsuite Flannel PJs”. As much as I love social media, he may have a point! Looking good! Those are some sharp looking jammies. Hi Andy from HootSuite! Sure, I’ll happily accept a HootKit. I’ll send you an email. Thanks for stopping by my blog! We haven’t received an email from you. Let us know your postal address and we’ll send that HootKit. Wow, Andy, thanks for following up. I just sent you an email with my info. Thanks!